We love the season of Fall. Don’t you? With it comes pumpkin lattes, apple pies, sweater weather, and MOPS! 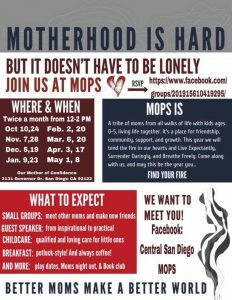 MOPS stands for Mothers of Preschoolers, although you can join us from pregnancy up through your child being in kindergarten. Here’s what you can expect: A sisterhood of women who get it. A sisterhood of women who will share the joys and challenges of motherhood with you. You can also expect speakers, arts and crafts, lessons that feed your soul, friendship, laughter and tears, and our theme for the year: Find Your Fire. We plan on having two Wednesday meetings a month. 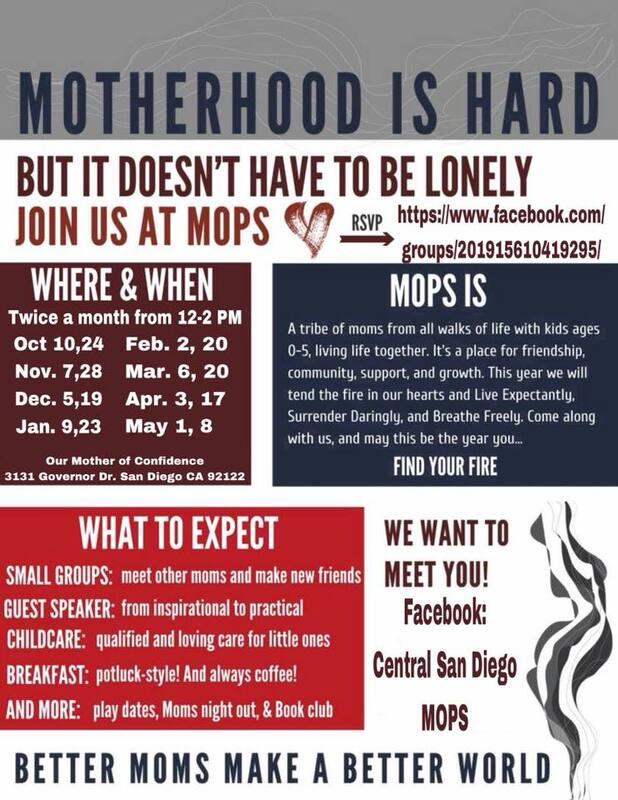 MOPS officially kicks off on Wednesday, October 24th. Please RSVP to Laura Alvarez by texting MOPS, your name, and if you are bringing your children and what ages they are: 858-276-1993. Can’t wait to see you on the 10th!